Provost and Dean of the Faculty Tracey Hucks announced today that professors Chris Vecsey and Lourdes Rojas-Paiewonsky will share the 2018 Jerome Balmuth Award for Teaching and Student Engagement. Professor Rojas-Paiewonsky is the Charles A. Dana Professor of Romance languages and literatures and Africana and Latin American studies. Her research interests — and her many published works — revolve around feminist literary criticism, Latin American and Spanish women writers, Caribbean literature, as well as feminism and politics in contemporary Latin America. Before launching her 34-year teaching career at Colgate, Rojas-Paiewonsky earned her BA and MA at the University of California at La Jolla. She received her PhD from SUNY Stony Brook. Professor Vecsey is the Harry Emerson Fosdick Professor of the humanities and Native American studies in the Department of Religion, which he also chairs. A powerful presence in Colgate’s classrooms for the last 35 years, he is the author and editor of more than a dozen books and countless articles on topics related to traditional American Indian religions, American Indian Christianity, American music history, journalism, and religion. Professor Vecsey earned his BA and MA at Hunter College and his PhD at Northwestern University. 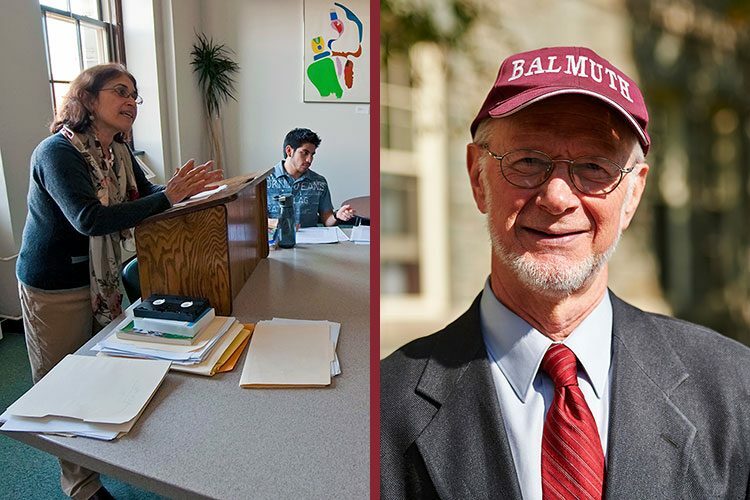 The Balmuth award was created in 2010 through a gift from Mark Siegel ’73 and has now recognized the distinctively successful and transformative teaching, regardless of methodology, of 10 Colgate faculty members. To find out more about award namesake Harry Emerson Fosdick Professor of Philosophy and Religion Jerry Balmuth, the impact of his teaching, and his commitment to scholarship, visit the Colgate Scene.